Download "SYMPHONY LEARNING LICENSE AND REMOTE HOSTED SERVICES AGREEMENT"
2 Services, the Support Services and any associated documentation from unauthorized use, access and distribution and to ensure that Users observe Customer s obligations and restrictions as stated in this Agreement relating to Symphony Learning s intellectual property and proprietary rights, including without limitation the Software, the Hosting Services, the Support Services and any associated documentation. Customer shall not modify, translate, reverse engineer, decompile, disassemble, or create derivative works based on the Software. In addition, Customer may only use the third party programs that are licensed and provided by Symphony Learning with and as a part of the Software hereunder only in conjunction with the Symphony Learning software program(s). Use of such third party software without the Symphony Learning software program(s) is not permitted. Further, Customer may not use such third party software programs for any purpose outside the scope defined In Sections 1.1 and 1.2 of this Agreement. 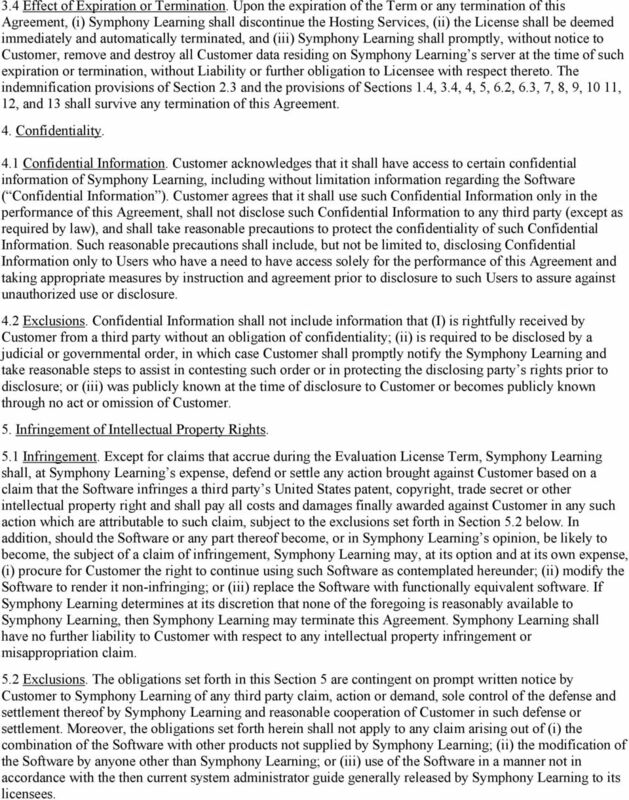 Customer agrees (i) to treat the Software as a confidential trade secret and valuable asset of Symphony Learning and its licensors; (ii) not to develop a competing product based on the Software; and (iii) not to sell, rent, lease, sublease, assign, timeshare, transfer or provide unlicensed third parties access by any means to the Software, the Hosting Services or the Support Services, in whole or in part, or any of Customer s rights under this Agreement. 1.4 Proprietary Rights and Acknowledgements. 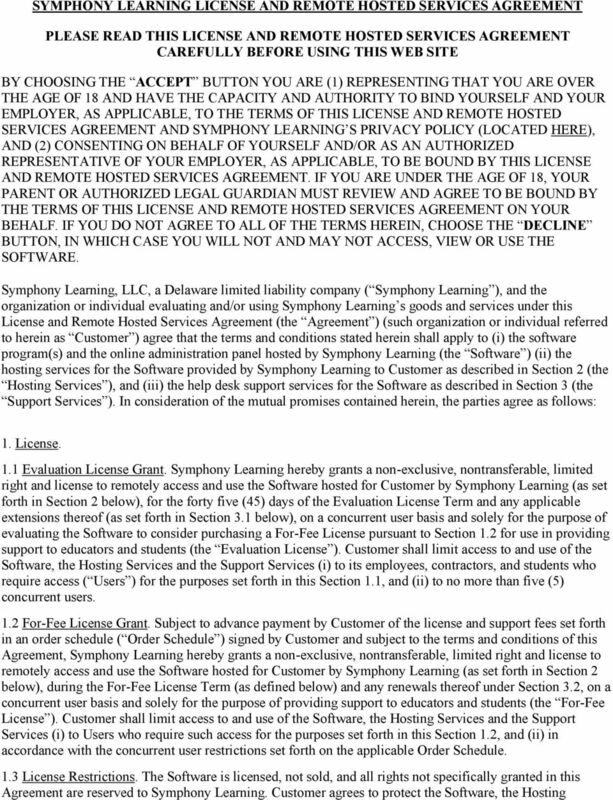 Customer acknowledges and agrees that (i) all right, title and interest in and to the Software, including any and all patents, copyrights, trade secret rights, trademarks, trade names and other proprietary rights therein and Improvements thereto, are retained solely by Symphony Learning and its licensors; and (ii) Symphony Learning may from time to time implement password protection, anti-copying sub-routines or other software or hardware-based security measures with respect to the Software and the Hosting Services, and Customer shall cooperate with any such measures. 1.5 Proprietary Markings. Customer shall not alter, remove or conceal any government restricted rights notice or any copyright, trademark, trade name or other proprietary marking or notice that may appear in or on the Software. 1.6 Usernames and Passwords. Symphony Learning or its designee will be responsible for assigning and delivering via a site administrator username and password to Customer for use by an administrator of Customer to generate and assign usernames and passwords for Users. Customer and Users shall not sell, rent, lease, sublease, assign, time-share, transfer or provide unlicensed third parties access by any means to such usernames and passwords. 1.7 Updates. Symphony learning shall have the right, but not the obligation, to modify the functionality of all or any portion of the Software at any time and from time to time for general release and to be accessed in connection with the Hosting Services. 2. Hosting Services. 2.1 Hosting Services. During the Evaluation Term and the For-Fee License Term (as those terms are defined in Section 3 below) Symphony Learning or its designee shall provide Symphony Learning-managed Hosting Services for User data and an online administration panel at a unique URL by means of the Internet for remote access and use by Customer and Users as set forth in Section 1 above, subject to the terms and conditions herein. Such Hosting Services shall be subject to certain hours of availability, gigabyte limits, available environments, administrative function restrictions and certain other restrictions, as may be imposed by Symphony Learning and communicated to Customer from time to time in Symphony Learning s sole discretion. 2.2 Performance and Hosting Environment. Symphony Learning provides no representations or warranties of any kind with respect to service performance, server availability, storage space and response times related to the Hosting Services. Symphony Learning reserves the right, at any time and without prior notice, to make the hosting server temporarily unavailable for use. In addition, Symphony Learning reserves the right to make changes, additions and replacements to its hosting environment at its discretion. 3 2.3 Non-Interference, Prohibited Uses, and Compliance with Laws. Customer warrants and represents that it will prevent conduct that would interfere with or disrupt other customers or licensees of Symphony Learning, or Symphony Learning s network or hosting services or network or hosting equipment. Customer acknowledges and agrees that the right to access and use the Software, the Hosting Services and the Support Services does not include the right to access the data or other information of any third party. Customer agrees that its access and that of Users shall be limited to information and portions of databases relating solely to Customer and such Users. Further, Customer shall not use the Hosting Services in any manner or for any purpose not contemplated by this Agreement, including without limitation, any unlawful or Illegal purposes, spamming, or the violation or attempted violation of the security or integrity of a network, service or system of Symphony Learning or others. Customer shall indemnify, defend and hold harmless Symphony Learning from and against any fine, penalty, cost, loss, damage, injury, obligation, demand, assessment, claim, expense or liability, including reasonable attorneys fees and expenses, asserted against or incurred by Symphony Learning arising out of Customer s or Users use of the Hosting Services, the Support Services or the Software for unlawful or illegal purposes or in violation or other breach of this Agreement. 2.4 Support Services. Subject to payment by Customer of the license and support fees set forth in the applicable Order Schedule, Symphony Learning shall provide Support Services to Customer during the initial year of the For-Fee License Term at no cost to Customer. Subject to advance payment by Customer of the license and support fees set forth in the applicable Order Schedule, Symphony Learning shall provide Support Services to Customer during the For-Fee License Term subsequent to the initial one year term of the For-Fee License Term. Support Services are limited to and phone support, Monday through Friday (excluding holidays), from 9:00 a.m. to 5:00 p.m. EST. Symphony Learning shall not be obligated to provide Support Services: (i) to Customer during the Evaluation License Term, or (ii) directly to Users at any time. 3. Term and Termination. 3.1 Evaluation License Term. The Evaluation License shall be effective as of the date on which Symphony Learning assigns and s a site administrator username and password to Customer pursuant to Section 1.6, and shall remain in effect for forty five (45) days thereafter, unless earlier terminated in accordance with the provisions set forth in Sections 3.3 or 3.4 below (the Evaluation License Term ). Upon request of Customer and at the sole discretion of Symphony Learning, Customer may obtain one or more forty five (45) day extensions of the Evaluation License Term, each such extension to begin running immediately upon the expiration of the previous forty five (45) days of the Evaluation License Term. 3.2 For-Fee License Term. The For-Fee License shall commence upon (i) the execution by the parties of this Agreement of an Order Schedule, and (ii) payment of the applicable license and support fees in such Order Schedule, and, unless earlier terminated in accordance with the provisions of Sections 3.3 or 3.4 below, shall continue in effect for one (1) year (the For-Fee License Term ). This Agreement and the For-Fee License Term shall renew automatically for subsequent one (1) year terms, subject to Customer s payment of the thencurrent applicable support fee. Symphony Learning reserves the right in its sole discretion to require that an additional Order Schedule be executed prior to such renewal in the event that additional fees or terms shall apply. Upon renewal, Symphony Learning shall renew for one (1) year the validity of Customer s site administrator username and password issued pursuant to Section 1.6. In the event that an additional Order Schedule is not required by Symphony Learning, the parties hereby agree that Customer s continued use of the Software, the Hosted Services and the Support Services shall indicate each party s respective agreement to renew this Agreement, the terms and conditions of which shall continue to govern Customer s use of the Hosting Services, the Support Services and the Software during the term of any such renewal, unless otherwise agreed to in writing by the parties. 3.3 Termination for Convenience. Either party may terminate this Agreement without cause by providing notice to the other party. 4 3.4 Effect of Expiration or Termination. Upon the expiration of the Term or any termination of this Agreement, (i) Symphony Learning shall discontinue the Hosting Services, (ii) the License shall be deemed immediately and automatically terminated, and (iii) Symphony Learning shall promptly, without notice to Customer, remove and destroy all Customer data residing on Symphony Learning s server at the time of such expiration or termination, without Liability or further obligation to Licensee with respect thereto. The indemnification provisions of Section 2.3 and the provisions of Sections 1.4, 3.4, 4, 5, 6.2, 6.3, 7, 8, 9, 10 11, 12, and 13 shall survive any termination of this Agreement. 4. Confidentiality. 4.1 Confidential Information. Customer acknowledges that it shall have access to certain confidential information of Symphony Learning, including without limitation information regarding the Software ( Confidential Information ). Customer agrees that it shall use such Confidential Information only in the performance of this Agreement, shall not disclose such Confidential Information to any third party (except as required by law), and shall take reasonable precautions to protect the confidentiality of such Confidential Information. Such reasonable precautions shall include, but not be limited to, disclosing Confidential Information only to Users who have a need to have access solely for the performance of this Agreement and taking appropriate measures by instruction and agreement prior to disclosure to such Users to assure against unauthorized use or disclosure. 4.2 Exclusions. Confidential Information shall not include information that (I) is rightfully received by Customer from a third party without an obligation of confidentiality; (ii) is required to be disclosed by a judicial or governmental order, in which case Customer shall promptly notify the Symphony Learning and take reasonable steps to assist in contesting such order or in protecting the disclosing party s rights prior to disclosure; or (iii) was publicly known at the time of disclosure to Customer or becomes publicly known through no act or omission of Customer. 5. Infringement of Intellectual Property Rights. 5.1 Infringement. Except for claims that accrue during the Evaluation License Term, Symphony Learning shall, at Symphony Learning s expense, defend or settle any action brought against Customer based on a claim that the Software infringes a third party s United States patent, copyright, trade secret or other intellectual property right and shall pay all costs and damages finally awarded against Customer in any such action which are attributable to such claim, subject to the exclusions set forth in Section 5.2 below. In addition, should the Software or any part thereof become, or in Symphony Learning s opinion, be likely to become, the subject of a claim of infringement, Symphony Learning may, at its option and at its own expense, (i) procure for Customer the right to continue using such Software as contemplated hereunder; (ii) modify the Software to render it non-infringing; or (iii) replace the Software with functionally equivalent software. If Symphony Learning determines at its discretion that none of the foregoing is reasonably available to Symphony Learning, then Symphony Learning may terminate this Agreement. Symphony Learning shall have no further liability to Customer with respect to any intellectual property infringement or misappropriation claim. 5.2 Exclusions. 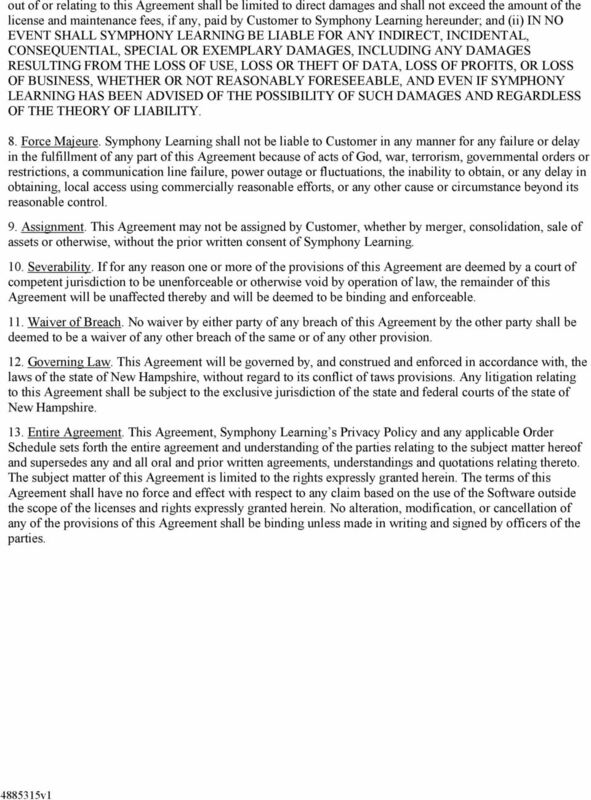 The obligations set forth in this Section 5 are contingent on prompt written notice by Customer to Symphony Learning of any third party claim, action or demand, sole control of the defense and settlement thereof by Symphony Learning and reasonable cooperation of Customer in such defense or settlement. Moreover, the obligations set forth herein shall not apply to any claim arising out of (i) the combination of the Software with other products not supplied by Symphony Learning; (ii) the modification of the Software by anyone other than Symphony Learning; or (iii) use of the Software in a manner not in accordance with the then current system administrator guide generally released by Symphony Learning to its licensees.